1) To have a knapweed insectary mass rearing weevils/moths for release at every Montana school that has knapweed in the area. 2) To have programs in every Montana County that monitor bio-release sites and take advantage of bursts of usable insects (bioagents) for collection and redistribution. 3) To incorporate noxious weed/invasive species education into the K-12 Montana State content standards and into usable teacher curriculum. (Coleoptera: Curculionidae) and/or the root boring moth Agapeta zoegana (Lepidoptera: Cochylidae). 1. To produce as many biological control agents (insects) as possible in as short a time as possible. 2. To educate people about: 1) noxious weeds and their control, 2) insects, 3) ecology, and 4) plants. Cochylidae) for Biological Control of Spotted Knapweed: Procedures and Cost. Biological Control, 4, 145-148. Coleoptera: Curculionidae) for Biological Control of Spotted Knapweed: Procedures and Cost. Biological Control, 7, 167-171. Blue Bird Mine Forest Service Release Site - A Success!! -Money: See below for some sources. -time: this is a labor intensive method of mass rearing biological control agents. -tiller: with removable tines to till between knapweed rows and around gardens. -mower/weed whip: if you need to maintain the area around the weed garden. corrals narrow enough so that your bird netting fits easily over them]. -bird netting: we ordered ours out of Hummert, rope or wire, tall stakes or fence posts. (post pounder). -fencing: fence posts, clips, and snow fencing or the orange plastic constriction fencing. 5) Local land owners such as ranchers/farmers, businesses, corporations. In Whitehall, we get our funding from a Noxious Weed Trust Fund grant, the Jefferson County Weed District, and the Whitehall Schools. In addition, Madison County, the BLM, and the Golden Sunlight Mine have contributed. Supervisor: You need a person in charge! Our funds are managed by Dave Burch, the Jefferson Co. Weed Supervisor, based at the county seat in Boulder, as directed by the County Weed District. The day to day operations are supervised by Whitehall science teacher Todd Breitenfeldt, who has a Master of Science degree in entomology. But, you do not need a masters, all you need is a realization of our horrid noxious weed problem and a willingness to help solve it!! Knapweed transplanted into Agapeta insect cage. Insectary #1 under construction- transplanted. Insectary #1 under construction- flashing/tools. Insectary #1 under construction- flashing/fence. Insectary #2 expansion- tear down old/tilling addition. Insectary #2 complete- more views. -Gather your equipment and tools. -Draw a plan of your site. -Till or plow your site. -Stake out your corral (for Cyphocleonus) and cage (for Agapeta) site(s). rows, with the plants about 2 feet apart. We pull up plants on rainy cool early spring days from infestations in our area. We trim the foliage as we pull them up. Keep them moist as you transport them and out of the hot sun (i.e.. do not let them dry out or cook...). Remember, these are root boring insects so you need an intact tap root on each plant. Water the transplants often until they are well established. stretch it out and stake it into place so that it is sunk into the ground about 5-8 cm (remember, these weevils can dig but do not fly so, this set up will keep them in your weed garden). We use wooden surveyor stakes and nail the flashing to the stakes with a hammer and a sledge hammer to support the stake while we pound in the nails. Fill in your trench. two reasons: 1) it is sharp (no sense getting cut up if you fall in it...), and 2) if the weevils try and climb the slippery flashing, this bent over section will cause them to fall off back into the corral. -Suspend bird netting over the corral with ropes and posts, to prevent bird predation. -Water the new transplants often 'till they are well established. between rows. Leave a walk way from the door into the center of the cage. You want high density of plants within the expensive cages for maximum production. Water the transplants often until they are well established. sure that the cage is insect proof. people) and have had very little vandalism even though we are on school grounds. 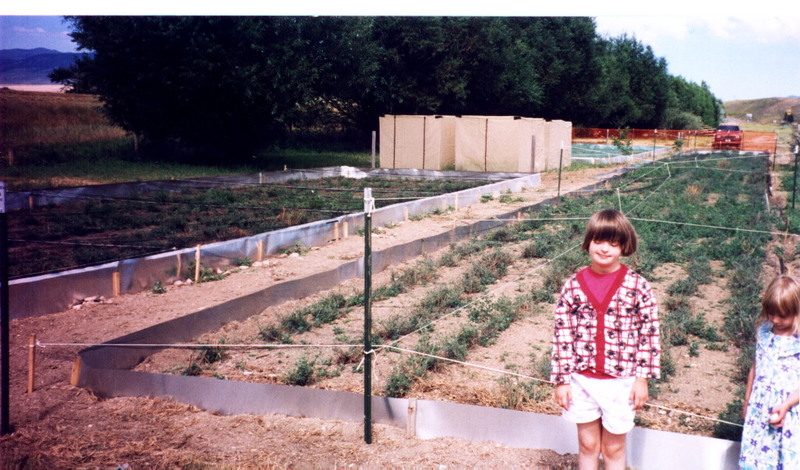 Early spring: Construct your plots, transplant, make corrals. Early spring - late fall Maintain the site. Mid summer Install bird netting. -Trim (clip) your knapweed plants often to keep them from going to seed. We try to create a mounded effect with much foliage to build root reserves but, no flowers. -Weed often to keep the soil temperature warm and consistent through out the corral (and to aid in finding those well camouflaged little rascals). We till between the rows in early spring (being careful not to disrupt the knapweed tap roots with the precious weevils!) and hand pull weeds the rest of the growing season. 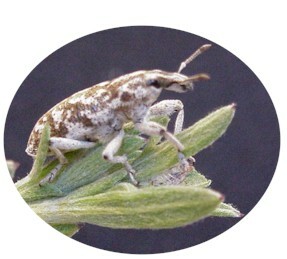 -Keep the number of weevils controlled so that the plants do not become over infested and die. This will cause your population in the corrals to crash. -In Whitehall the adult weevils usually began to emerge the first week of August. We begin collection 1-2 wks. after. We usually collect 3 times/wk. in late morning and early afternoon when the weevils are active and easier to find. To collect, you have to carefully search the foliage of the plants and the ground in the corral. Gently hand pick each weevil- they sometimes cling to the foliage and we often must break off that knapweed stem or leaf so as not to injure the weevil. They also often just drop off the plant when molested and are very hard to locate within the plant or on the ground when this happens. We store them in paper cans with some spotted knapweed foliage. The weevils can be stored for a few days in the refrigerator (not freezer!!) or a cooler, in paper cans with some foliage and a paper towel. Transport is generally in paper cans with foliage placed in a cooler with an ice pack. Keep the weevil container from directly touching the ice pack (separate with some crumpled newspaper) as this might be to cold for the weevils. -Be sure that the land owner is well informed and agrees to the conditions listed below. -Keep good records and photographs to show the changes over time. The changes are often so gradual that they will not be obvious with out the photographic record. -Field release sites should be fairly large infestations (several acres or more) contiguous to other infestations so that the weevils can spread. Drier, open, south or west facing sites with somewhat sandy soil are preferred, that will not be flooded. The spotted knapweed plants should be fairly (but not overly) dense. The site should not be: 1) disturbed for at least 5 years, 2) sprayed with herbicide or insecticide, or 3) heavily grazed from July-November. -If there are a number of grazing animals on the site, a 40 yard (m) square enclosure fence should be constructed around the release to keep the grazers from stepping on and squishing the adult weevils. -Release 80-100 or more insects in one spot. -Our philosophy in Jefferson County on releases is to release yearly on a number of well chosen sites until good establishment of the biological control agent occurs, rather than releasing only once on many more sites spread all over, in hopes some will take. Early June Put up insect cages and nets. Mid June-July Introduce moths into the cages. Mid June-September Collect adult moths for field release from well established cages. -Weed often to keep the soil temperature warm and consistent through out the cage (and to aid in finding the moths). We hand pull weeds. -Keep the number of moths controlled so that the plants do not become over infested and die. This will cause your population to crash. -We release 30-40 moths into a new cage for 2-3 days to start the initial population. -Once the population is doing well in a cage, you can collect almost daily for most of the summer. Again, keep the number of moths controlled so that the plants do not become over infested and die. -Watch your plants in the cages closely, and replace those in the cages that are obviously dead. -We are rather low budget in Whitehall, so we hand collect with a paint brush to brush the moths into the paper can, and/or a small insect net. A modified vacuum can be used to collect these insects. The moths can be stored for a day or two in the refrigerator (not freezer!!) or a cooler, in paper cans with some foliage and a paper towel. They are more fragile and short lived than the Cyphocleonus weevils and need to be handled carefully with that in mind. Transport is generally in paper cans with foliage placed in a cooler with an ice pack. Keep the moth container from directly touching the ice pack (separate with some crumpled newspaper) as this might be to cold for the moths. Because, the moths are short lived, transport as soon as possible. -Field release sites should be fairly large infestations (several acres or more) contiguous to other infestations so that the moths can spread. Drier, open, are preferred, that will not be flooded. The spotted knapweed plants should be fairly (but not overly) dense. -The site should not be: 1) disturbed for at least 5 years, 2) sprayed with herbicide or insecticide, or 3) heavily grazed in the summer. -Agapeta are much harder to rear and require expensive cages and much more labor. However, because of the magnitude of the spotted knapweed problem in Montana, we feel the cost and effort are well worth while. As soon as field sites in your area have built up enough population, insectary/mass rearing efforts should be ended and more cost effective collections for redistribution with sweep nets from these field sites should be initiated. (Have a net day! ).